When you make sales that aren’t automatically entered into your ZipBooks account, you can add them in a snap. Click on the round green ‘+’ button above the top right corner of the list. Four buttons will appear. Click the green Deposit button. The Add Deposit drawer will slide in from the right. Fill in the details including Date, the Account the money was paid to, Amount, Category (the revenue or sales account that applies). Click the Add Split button to divide the amount among multiple categories. Add a Name (generally your business name, if it’s a deposit), and any Tags that apply. Include any Notes needed, and add Attachments by clicking the small green ‘+’ button toward the bottom of the form. Your sales transaction will now appear in your list of transactions. 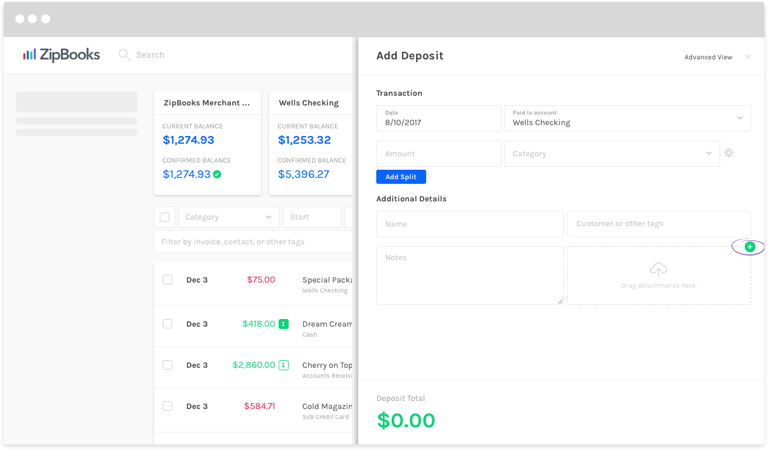 If you want to manually enter debits and credits for this deposit, you can use the Advanced View link in the top right corner of the drawer screen.